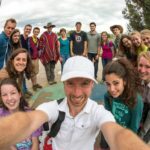 Favorite Country: Colombia – I spent a summer on the Amazon and fell in love the people and culture! Strangest food I’ve ever eaten: I sucked on fish heads one summer and surprisingly was a natural at it. I never travel without… good music and an appetite to try new things! Me in 12 Words or Less: Life is adventure; live every moment to the fullest! I grew up on a small family farm in North Central Florida where I was active in 4-H and livestock projects. Growing up, if we were not on the farm, we loved to travel and spend time outdoors on spur of the moment trips (the kind you can only take when you’re homeschooled). When I was 15, my parents took us on our first mission trip to Brazil and our eyes were opened to a much larger world than our small town. I currently run a cattle farm in the Panhandle of Florida (practically LA or lower Alabama). During my spare time I love doing kids’ ministry and hanging out with friends. I love to grill out and am always trying out new things! I love traveling and experiencing new places and foods so lets go on this next adventure together! I was blessed to grow up in a home where my parents were intentional about embracing people from all walks of life in our community and abroad. At 15 I went on my first mission trip with my family and began to understand the heart of God and His desire to have a relationship with all people. I think one of the best descriptions of this is found in Isaiah 6:1-9. In this passage, Isaiah sees the holiness of God compared to the unclean lips of the people of Judah. After being cleansed by the hot coal, Isaiah was commissioned to go forth and tell of the holiness of God to the nations. God’s heart for the nations is still the same and if we have seen the glory of God we too are commissioned to be the light of Christ wherever we may go. I believe that the results of international ministry will never be fully known until heaven. Sometimes get to see changes in the lives of the people we serve as we build relationships with people all over the world. However, many times the greatest results we see immediately are the changes in our own lives. Most of us will return to our homes, jobs or schools after an international trip. When we come back home, we must ask the question of how we can apply the lessons learned while on the mission trip in our context at home. We can learn so much from the people we go to serve when we open our eyes and hearts and let them touch us. We will be changed forever.